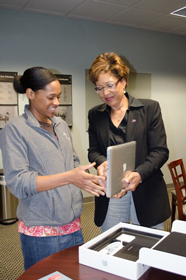 Jasmine Welch, senior in elementary education, Junction City, received a laptop Sept. 11 from Doris Wright Carroll, associate professor in special education, counseling and student affairs. Welch is the 2012-13 recipient of the Doris Wright Carroll Multicultural Technology Award and the Lawrence G. Wright Scholarship, a fund created in Carroll’s father’s honor to celebrate his contributions to the field of diversity at Santa Fe Railroad. The technology award is in line with Carroll’s belief of going above and beyond, both in and out of the classroom, to promote success for multicultural students. Doris Wright Carroll is also a professor in the Academic Advising Graduate Program.